Recently, the Holiday Inn Shanghai Pudong Kangqiao made waves with its swimming pool, perched atop the 24-story building.Impressively, part of the indoor pool hangs out past the building's edge, and is constructed with a glass bottom. Hotel guests describe a delirious sense of swimming in the sky - like flying. Exactly 30 meters long (about 98 feet), six meters wide (20 feet) and 1.5 meters deep (5 feet), the swimming pool is the first of its kind in China. Swimming in such a radical pool, with just a glass pane between you and a 24-story drop, is really an exciting experience. 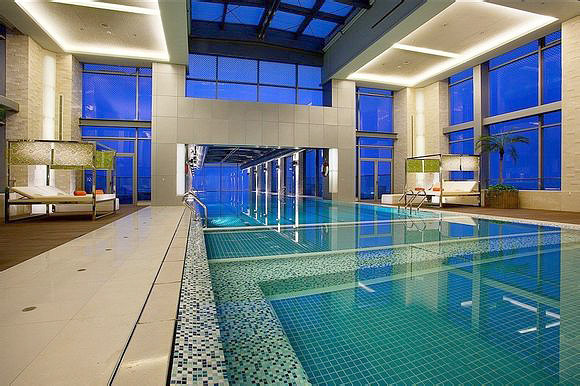 No doubt the swimming pool has exceptional views, from the inside and outside. 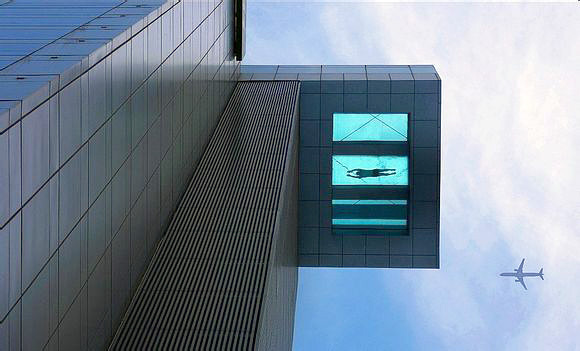 The glass-bottom section allows swimmers to see the street below, and conversely, people on the street can look up and watch the swimmers. While not splashing in the water, guests can enjoy Pudong urban views stretching as far as the Lujiazui skyline at the poolside lounge.